I knew prior to accepting the position that the year would be filled with ups and downs. I knew the sheer negativity of the job would be an overwhelming obstacle. I knew that frustrations would come from personality conflicts with my colleagues. I knew that I would get yelled at by kids and parents. I knew that teachers would disagree with the way I handled a situation. I knew I would be exhausted. Likewise, in the weeks leading up to the start of the year I had high hopes for what I could accomplish. I hoped that I could make a difference. I hoped that I could support the teachers. I hoped I could partner with parents. I hoped I could save kids; save them from themselves; save them from the system. As I have grown in my experiences I have become an advocate: an advocate for parents who are at their wits-end; an advocate for parents who don’t have time or the ability to care; an advocate for teachers who want to do more, but find resistance in the most unlikely of places; an advocate for students whose voices can’t be heard. I believe that everyone cares about success. No one wants to accept failure; it is only accepted as a last resort, when all hope is gone. We must ask ourselves, “Are we willing to let that hope die?” “How many times do we have an obligation to provide a second-chance?” “Did they really learn from their mistakes?” And perhaps the most difficult question of all, “Are we the ones killing the hope?” I believe everyone cares about the success—of some. The parents I talk to, the ones who get mad, fight for their children. I’ve had parents scream at me. I’ve had mothers threaten me with lawsuits, or worse. I’ve had parents cry; cry out for help. They see that kids are treated differently; they see that their children hate school; they see what a dangerous path their sons and daughters have chosen; they are struck with fear, paralyzed and incapable of intervening; they are fighting for what they believe in; they are desperately searching for a helping hand. I’ve had parents complain that we’ve let them down, and they are right. Most parents want to help; some aren’t sure if it is welcomed. One mother recently told me that she appreciated the way she was treated by me, that she had been afraid to come down to the school because of how she was treated in the past. What are we doing as a school, as a system, as human beings, to cause such fear and distrust? Maybe it is because they had a bad experience when they were in school, but maybe not. Whatever the reason, some of our parents do not, or cannot, trust that we have the best interest of their sons and daughters at heart. I had a mother in my office last week angry that I wasn’t keeping her daughter safe, ready to remove her daughter from school. I didn’t really know her daughter was in danger, but other people were aware of the situation. We don’t communicate enough, with parents, with each other. “Why didn’t the teacher call me?” “I’ve left messages and no one will call me back.” “The teachers don’t care…” “The parents don’t care…” Do any of us really believe that? If so, we have lost. We have lost sight of what is important. We have lost sight of hope. We have lost that child. Do some parents let us down? Do some parents let their children down? Absolutely. Whatever the reason we have parents that do not seem to care about their children. They are addicted to drugs. They are single mothers or fathers working two jobs so that their children can have a better life. They are too wrapped up in their own problems. I called a father earlier in the year about his son’s behavior. It was a minor infraction, but I felt it my place to let dad know. His message back to me completely changed how I have handled issues with his son. “You have got to be kidding me…chop off his hand…do whatever you need to do…I was a kid once…I bet that you’ve done the same thing…don’t call me for stupid stuff like this.” Wow. I talked with this young man (and yes he has grown into one) the other day at lunch. The mohawk has been gone for a while; I haven’t seen much black since that basketball game; I see him talk with friends; I see him smile. He is still failing most of his classes, but he hasn’t yelled at a teacher for months. He hasn’t lived with dad for months. He is fifteen years old, homeless, bouncing from friend’s couch to friend’s couch. We are his only refuge. Do we know it? Do we truly understand the impact that our words have on students? Many times I’ve had kids in my office, removed from class for disrupting, swearing, leaving. The teachers are angry; they want them hammered, nailed, crucified. I ask, “Why are you here?” and too many times I hear, “the teacher called me stupid,” or “the teacher got mad and yelled at me, so I yelled back,” or “they don’t respect me, why should I respect them.” It’s no wonder students hate school. I sympathize with them; I would have done the same thing. When I took the job, I knew what the teachers wanted; I knew what the students wanted—consistency. In as much as I have been able to, I have held consistent. The consequences haven’t always been consistent, but I have tried to stay consistent in addressing the behaviors. Discipline isn’t assigning consequences; discipline is teaching appropriate behavior; it is about teaching good decision making. I believe in no-tolerance. We shouldn’t tolerate any negative or inappropriate behavior. That doesn’t mean we slap consequences on the kids, but it does mean we have an obligation to teach why it is wrong and what to do better next time. It also doesn’t mean that we encourage the behavior to continue by not assigning consequences. They are an important element of the process. Students should be held accountable, but we are also responsible to make sure they learn from their mistakes. If we unjustly overreact and punish a student that didn’t deserve it, we risk losing all of the groundwork laid by the teachers and/or the parents. If we unceremoniously dismiss the behavior and not assign a consequence, we have failed to teach the child what is appropriate, and ultimately we fail that child. I know I have overreacted and had to comeback, swallow my pride, and earn the trust back. I also know, whatever the reason, I have failed to reach children whose words and actions say, “What are you going to do about it?” and in my situation, my frustration, my uncertainty I say nothing; I do nothing; I am paralyzed. Finally I speak, “You just don’t get it do you?” He laughs, “No,” and walks away. Empowered by his bravado; empowered by too many times being allowed to get away with it. I’ve tried, but nothing will stick. His actions say, “You can’t touch me.” And he is right; he is untouchable, like so many others. I wonder if we understand how some of our students feel, what they see. “The teachers will help the popular girls, but not me.” “How come the white kids can wear bandanas, but I’d get suspended if I did?” “Why do the jocks get treated different? They get away with everything. Why don’t they ever get in trouble?” I get asked these questions all the time. I don’t know what to tell them. I pretend it isn’t true, but I know better. I should speak out, but when I have, I feel no different than the kids. I stay quiet; I stay silent; I have failed them. I am not blameless; I’ve yelled at kids; I’ve gotten caught up in the negativity of a situation; I’m guilty too. I had a student in the office coming back from a suspension. He didn’t want to be in the room; he didn’t want to face his past. I called him out; mom came to our rescue. I listened to his story; I watched his pain; I offered my hand in apology. For the first couple weeks of the year I spoke with a young man almost daily. He didn’t want to quit smoking; he didn’t like our rules; he didn’t try to hide it. After a while he stopped coming to school. The next time I saw him he was dropping out; he wouldn’t look me in the eye. “It really hurt me…” and he went on to tell me a story. I had given him the impression that I was looking for a reason to get rid of him. I had given him the impression that I didn’t care. I apologized; he looked me in the eye and shook my hand. I love B-day team meetings. I was never required to attend. They were never required to invite me. On particular days, when I needed a reminder of why I was doing what I was doing, I would venture into the staff meeting room. “I’m worried about…” and the next ten minutes was spent discussing more than just grades. I loved listening to the teachers talk about their students; even the frustrations came from caring hearts, hoping to do more. It became my haven. I never said it, but I think they knew it. 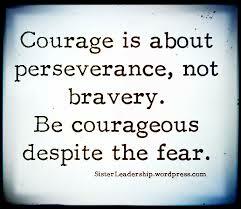 It takes courage to teach; it takes nerve. I’ve had teachers stand up for kids who have done something wrong. They have gone the extra step to say, “I believe in this one.” That is what teaching is, believing. Security responded to a called verbal altercation in a classroom. One of the boys sat in his chair, stunned by what had just happened; the other had left campus. I was prepared to suspend both boys, but I wanted to talk with the teachers first, “I’m not sure it will help.” I asked, “How can I help you help them?” “Make them come in after school for extra help.” One did, one didn’t; both have dropped out of school. It takes courage to face that challenge day after day. It takes courage to believe that students can overcome the odds and not become statistics. One student who knows me very well asked me one day why I had been so grumpy. I knew I had been run down, but didn’t think I was wearing it on my face. She knew better; she knew me well enough to know; she reminded me why I became a teacher. I watched her struggle when she was a freshman; I watched her drop out as a sophomore; I watched her graduate this year. She refused to “become a product of her environment”; she “refused to be a statistic”. Her words, not mine. I can name ten kids right now that didn’t. They got caught up in their own issues. Sometimes we helped them and they still chose another path. Sometimes we showed them the door. I can’t help but think where they are now. I talked with one of them last week. I hadn’t seen her since spring break. While she was here, she took a large percentage of my time. Trouble followed her, and I think she enjoyed it. She came in with her mother to pick up some paperwork. I asked her where she’d been; she said she’d been locked up for two months. For the first time, I heard her say, “I learned some things about me while I was in. I don’t want to go back, but I’m not sure I can do it.” We talked for a while; I told her I hoped she didn’t; I told her mom to let me know if she did and I would visit. Her mom thanked me; she gave me a hug. I know that someday I will have to make that visit. I hope it isn’t for her, but it will be for someone else. I’ve known one of them for four years. When we first met he was a gang banger; he was rude; he was just a boy. He is on probation for stealing a car; he is out of the gang, but not quite far enough; he is going to be a father; he is a man. The other I have gotten to know too well from his frequent visits to my office. I’ve suspended him five times for verbal and physical fights; I see potential; he is one of the best poets I’ve read. Neither gang likes him; he’s argued with both, and lost. He won’t raise his voice; he won’t raise a fist; he stands there and takes it, hands at his side, almost inviting a punch; few have come. I joke with him that he’s too young to be the next Gandhi, but his time will come. When I calmed down I put them in my office together, and I closed the door. A red hat sat on table between them. I am firm, “No talking, just listen,” neither looked up at me or each other. I can’t sit; I stand and I talk; I preach; I beg. “If I sign that line, you go to jail.” “If I sign that line, you get kicked out of school.” “Are you willing to throw away everything for a red hat?” Neither claims a gang, yet the stigma of the hat, the law of the streets, dictates that they should care. “You don’t even know each other; you know nothing about each other.” They were quiet for a while. Then they began to talk. They talked about their homes; they talked about their history; they talked about life. They realized that they were very similar. They understood each other. I left them in my office together. I couldn’t make the determination on their consequences, but I went to bat for them with the principal. They went back to class; the red hat hangs on my wall. A week later a similar issue occurred, only the colors were real. I had the same talk. The results were strained, forced. In another week one of those boys got in a fight. It had nothing to do with gangs or colors; it had to do with toilet paper and a prank. He had been given his last chance and blown it. His mother had worked with us all year to try and keep him in school. I used to call and leave messages and she’d be in the office by the end of the day, her son sitting beside her. She cared; I cared. In the end it didn’t matter. I suspended him; he was referred for expulsion. Over the weekend he threatened to stab or shoot the kid he’d fought. So I ask myself, “Have I made a difference?” I hope so, with some. I am tired of watching the system fail. I am tired of watching kids slip through unnoticed. I am tired of pretending I don’t care. I am tired of remaining silent. I’m tired of being afraid to answer the difficult questions. “Are we willing to let that hope die?” I hope not, but sometimes I wonder. “Did they really learn from their mistakes?” Some did, but others still laugh at us. “Are we the ones killing the hope?” Not always, but sometimes I fear we are. “How many times do we have an obligation to provide a second-chance?” At least once more. To the teachers that worked alongside me to give kids that second-chance, thank you. It was your positive spirits and caring hearts that helped carry me through. I sought to empower you to empower kids, and I saw that; I saw it work and I saw you pull your hair out resisting failure until the end. To the teachers that don’t see what I see, I wish I could share my vision. Sometimes there is more to the kid sitting in a desk than your class, your homework. Sometimes there is more behind the words they speak or the actions they commit. To the parents that offered their support in tough situations, thank you. I know you care about your children enough to hold them accountable. I want you to know I truly care about the success of your son or daughter. To the parents that couldn’t offer their support in tough situations, thank you. I know you care about your children enough to fight for what you believe is right. I am sorry I couldn’t do more to help in that fight. I want you to know I truly care about the success of your son or daughter. To the students who never came to my office, thank you. It was busy enough without you, though I wish I had time to get to know you and help you reach your dreams. To the students who came on a more frequent basis, thank you for keeping me on my feet. I am grateful I was able to cross paths with you and hope that someday in the future we may meet on more favorable terms. To the students I have forgotten, I am sorry I have moved on and let you go or left you behind. To the students I will never forget, thank you for teaching me the meaning of compassion, patience, learning, and most of all…hope. So I will go; I will recharge; I will rest; I will return with hope. A couple months ago I was in a parent meeting…an 8th grade boy with major attitude problems at home and the problems were starting to pop up at school. He was disrespectful to teachers in the hallway, refusing to follow rules, argumentative with authority. Home was worse…he resisted any authority of his parents, particularly his step-father. His actions had earned him being grounded from his friends, computer, and phone. And instead of things getting better, they got worse. He attempted to negotiate where he had no standing…promising better behavior if the parents returned privileges. He refused to accept responsibility for his actions, or even show understanding that his actions were tied to his consequences. So…A wise old man once told me that the current generation of kids, particularly boys, should be referred to as the Reset Generation. He offered a unique premise: that kids raised in the video game age are used to a reset option. And that the more we see the prevalence of video games influencing children at younger ages, the more solidified this concept becomes in their social/emotional developmental process. When he brought this concept up in the parent meeting it was like a lightning storm struck…in that parent meeting, I was not facilitating the meeting as an administrator…I was sitting there as a step-father, banging my head against the will of a thirteen year old. As the detective talked about the Reset Generation, my perspective shifted dramatically…he had just described my son to a tee. Being able to see him in a different light allowed me to take the first step toward recovery…not in what I expected from my son, but how I needed to change my tactics to get the best from him. I have come to the conclusion that, as with most things, there are pros and cons to the reset switch that young people expect in real life, just as with their fictional characters on a console. Adapting to a video game environment where a character dies or an obstacle is too big to conquer, a player simply restarts at the last save point. In this scenario, anything that happened in the last mission technically does not exist…therefore…the player cannot be held responsible for it. Sure, depending on the game, they may lose some experience points each time they die, but by and large, mistakes have no lasting consequences. For kids in the Reset Generation, there is an emphasis on learning from mistakes…take as many resets or reloads as necessary to successfully complete the mission. However, once the mission has been restarted, there is no need to discuss the previous attempt. The player has no desire to discuss or acknowledge defeat, but simply wishes to try again without making the same mistake, yearning for that euphoric moment when the mission is successfully completed. Is that a bad thing? Perhaps in some regards. 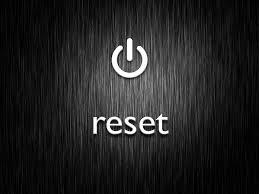 In real life, not all problems in life can be avoided by hitting the reset switch…and some mistakes cannot be undone. But I do think there are myriad opportunities in life that there is some redeeming value in being able to put the past behind you and moving forward. Typically, I work through a behavior issue with a student by getting them to admit responsibility for their actions, then we talk about learning from our mistakes and moving forward. What I have come to understand is that for some kids, refusing to admit their fault does not equate with whether they accept responsibility …and forcing them to admit it, might even be tantamount to subjecting them to humiliation and ridicule. All they want is a chance to reset…forget the failure…try again without judgment…show that they will approach the mission differently the next time.